Asoka inspires mixed emotions. On the one hand, there are elements of pure beauty and love and then you have a contrast in the horrors of war. The cinematography is rich and awe-inspiring. I was literally mesmerized. This is not a romance in the sense of peace and love, this is a tragic tale of two hearts looking for one another amidst a world of betrayal and deceit. Not to mention a lust for power. The plot is complex and there are elements of revenge, cruelty and battles on a large scale. The intensity in the contrast is at times overwhelming. The action never seems to subside into a moment of peace. Either passion dances across the screen or horror and suspense surround the characters. The musical numbers give some relief from the intensity, yet they are also equally vibrant. This legendary story is recorded in a second century book called the "Asokavadana.” The movie is based loosely on the story and at the end there is the implication of the renunciation of war. It is emotional from the start and is dark in its lust for power and beautiful in its exotic swirling dance sequences. An almost mythological atmosphere pervades the film in places. The story begins when Asoka’s grandfather tosses his sword into a waterfall because the sword hungers for blood. As his grandfather leaves, Asoka searches for the sword and finds it. When he is older his life is in danger. His mother, Dharma (Subhashini Ali), asks him to save his life by fleeing. After changing his name to Pawan, he meets Kaurwaki who is following a similar fate and is hiding out in the lush green countryside with her much younger brother Prince Arya. Prince Asoka/Pawan (Shah Rukh Khan) and the feisty and sensuous Princess Kaurwaki (Kareena Kapoor) imagine they have met before and Asoka calls her "my warrior." So romantic! The story then dives into a crystal pool of the most primal instincts. A man fighting for a woman, a warrior woman fighting for her land. Splashes of color spread out against a pastel blue sky. Swords become a part of the characters as they fight for their lives. There is a reward for finding Kaurwaki as she is the daughter of the king of Kalinga. We know he is going to pay some terrible price for his love. They marry and just as soon as you think this story is going to move in a good direction, Asoka’s mother calls him back and he is then sent off on a mission. “What is this surge of love? Do I drown to experience it? On his return, he is told that his true love is dead. Once convinced, his aggressive nature emerges. He has no reason to live and desires only death. This loss of love seems to make him lust for power as he has lost the influence of Kaurwaki’s love. He then ascends the throne of Magadha in the 3rd century BC. When he decides to extend the borders of his empire, he wages a bloody war on Kalinga, a neighboring kingdom. This review refers to a Widescreen edition. My only complaint was the extent of the violence in places and the subtitles were white and difficult to read at times. If you loved Lagaan, this movie is much more tragic. 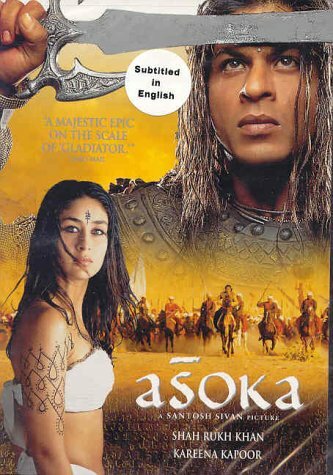 The story of Asoka’s journey from war to peace. A mingling of intense sensuality with the bitterness of war. One who lives life with passion is like a brightly burning fire.